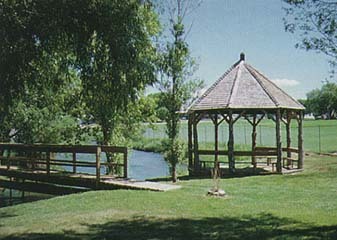 A modern park on the site of the springs. Natural bubbling pools of carbonated water, caused by ancient volcanic activity, have long made Soda Springs an attraction. Local Indians, fur traders and trappers visited the springs prior to the days of the Oregon Trail emigrations. Soda Springs was located along a shortcut in the trail off of the main route to Fort Hall. Emigrants used the pools of water for medicinal and bathing purposes. Many pioneers and their animals became sick when they drank too much of the alkali water from the springs.